After three days of dodging container ships, unlit fishing boats and all manner of objects floating in the sea, Team Telefónica navigator Andrew Cape couldn’t hide his relief at being clear of the Malacca Strait – but said the danger is not over yet. Not only is Cape charged with getting his crew around the world ahead of their five rival teams, he must also ensure their safety as they take on some of the most dangerous bodies of water in the world. 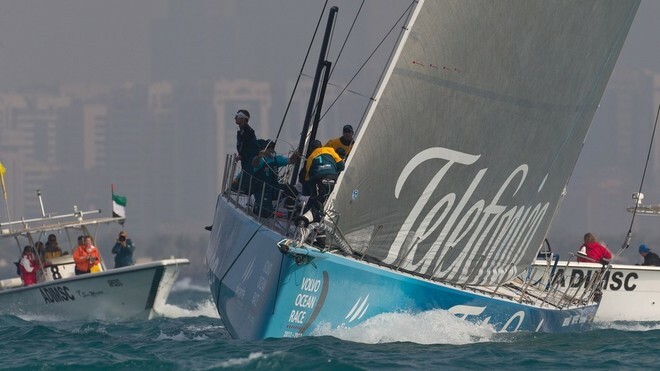 Telefónica led the fleet out of the strait and into the South China Sea yesterday, but four-time race veteran Cape said more challenges lie ahead in the race to Sanya. The main tactical hurdle on the final phase of the leg revolves around the strong current that sweeps down the coast of Vietnam and winds offshore blowing up to 35 knots. Whether the teams choose to hug the coast staying out of the strongest tide and biggest seas but sacrificing better winds, or gamble against the current and sea state in favour of higher wind speeds, could hold the key to success – or failure. ‘We’ve just got to work out the best way to get to the finish,’ Cape said. ‘Unfortunately that involves heading up towards Vietnam, where there’s stronger winds particularly on the corner. ‘We have to take that on and hopefully it won’t be too bad and the winds won’t be super strong. So we just have to make sure nothing goes wrong.